Matthew Goodwin, co-author of Revolt on The Right, gave an overview of UKIP’s prospects at a Ladbrokes hosted event today. His headline tip was for UKIP to win six seats, which is a 10/1 shot with Ladbrokes at the moment. He was extremely bullish about Nigel Farage’s chances in Thanet South, speculating that the Tories and Labour might be quite close to winding down any real attempts to stop a UKIP victory here. We also heard a fascinating analysis of the Green surge from James Dennison who was very confident that Caroline Lucas would hold on in Brighton Pavilion. He predicted that Bristol West would be the focus of most other resources from the national party and, consequently, a gain in Norwich South was extremely unlikely. Whilst the Greens’ odds in places like Bristol West & Norwich South have shortened a little in recent days, the more significant betting moves have been in seats where a Green Surge have improved the odds of a Tory victory. Below are five seats in which the Conservative odds have shortened as a result of an expected improvement in the Green vote. These aren’t seats that anyone really expects the Greens to win; anyone who disagrees can take advantage of the odds on a Green gain in each constituency, which I have helpfully included. I’ve also shown the current forecast vote share for each seat as projected by the excellent electionforecast site. So, in four of these seats, the projected Green vote share easily covers the projected Tory majority. In the other, Stroud, it’s making the outcome a whole lot closer than it might otherwise be. Of course, not every Green voter is someone who would otherwise vote Labour. I expect there are a lot of people in there who otherwise wouldn’t bother to vote, as well as a lot of ex-Lib Dems. All the same, I think the Labour challengers in each of these seats will be pushing a “Vote Green, Get Tory” message, and I don’t think anyone could really blame them for that. You can find our odds on every GB constituency here. If the Green surge is going to convert into seats, it’s pretty clear from Ladbrokes’ odds that Bristol West could become their second Westminster victory. A Green victory here would be very bad news for Ladbrokes; when we opened up our betting on the seat last July, they were 100/1. Now they’ve been backed down to 5/1 and I wouldn’t be surprised to see that get shorter still. We hadn’t properly appreciated the recent local gains that the party had made here (after all, they won under 4% of the vote in the last general election). The very large student population is undoubtedly a factor here. However, there are early indications that student registration on the electoral roll may fall as a result of Individual Electoral Registration, which might hamper the Greens more than any other party. The apparent large increases in Green membership may help them with the extra organisation and resources they will need to combat this issue. How many seats will the Greens win at the general election? Until recently, most of us had been assuming that the Greens would have enough of a job holding on to their one seat in Brighton Pavilion. 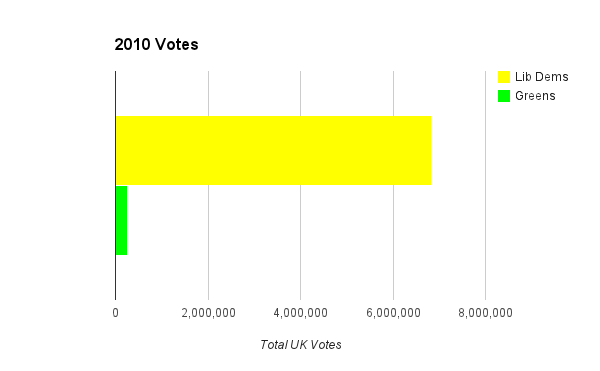 Perhaps an outside chance in Norwich South, but that was about it. Some good recent national opinion polls have led to speculation that they might do a bit better than that. Bristol West came as a bit of a surprise to me when people started backing it at 100/1. 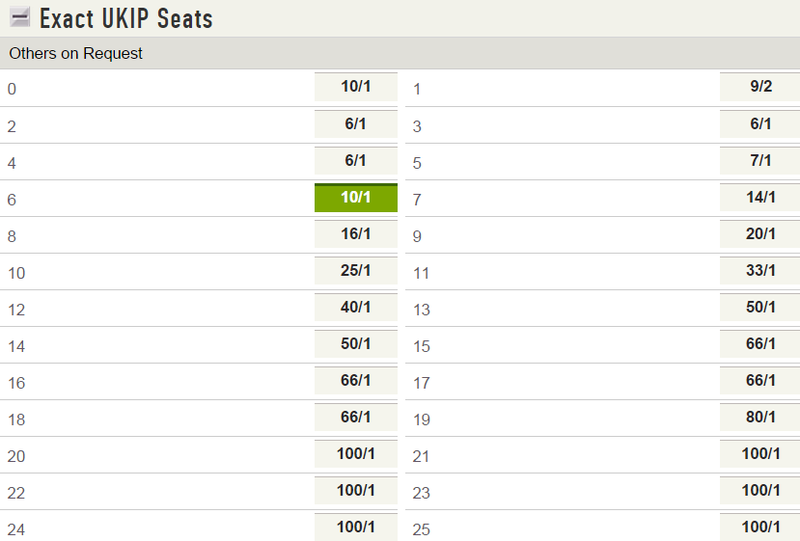 Now 10/1, that would be a very expensive result for Ladbrokes. Perhaps not quite as bad as Brighton Pavilion in 2010, which was one of the biggest betting contests out of all 650 UK constituencies. Caroline Lucas only just scraped home back then, but the Greens had been backed in from 5/1. Norwich South was their number two target at the last election, and there’s not reason why they couldn’t go close again in 2015. If, as expected, the Liberal Democrats are turfed out with a vastly reduced vote, the seat is very much up for grabs between Labour and the Greens. I’m starting to think 6/1 might be a big price there. It looks like their other hopes are mostly seats with big student/university populations and classic Guardianista territory. It looks a big ask for them to actually win any of these, so we’re quoting 25/1 that the party wins six or more seats next May.